New Hampshire shows how the candidates watch their money - or not. The political spotlight that shines on tiny New Hampshire every four years has moved on, leaving dashed hopes and expectations in its wake as it always does. One expectation that wasn't dashed was that media bias and venality would be on full display. In Iowa, Ted Cruz won by a solid margin, but the "big news" was Marco Rubio's "unexpectedly strong" third-place showing. Since when has the second place winner been remembered, to say nothing of third? Then Ted Cruz earned third place in New Hampshire, which was much better than expected given that state's increasing liberalism and atheism. In fairness, shouldn't this finally earn Cruz some attention as it did Rubio? Of course not: this time, the "real story" was Ohio Gov. John Kasich's second-place win. This bias is even more bogus than it seems, considering that as Gov. Kasich himself said, "I ought to be running in a Democrat primary." Sure, he put in a respectable showing in almost-blue New Hampshire, but he pulled in a derisory 1.9% in Iowa and can reasonably figure to do just as badly throughout the religious, conservative South. So why is this one-off fluke breaking news? It's not as if there isn't any real, relevant news - in fact, there is plenty of it. Considering that our national debt, as Donald Trump pointed out, is on track to reach an unimaginable $20 trillion, isn't it important for America to know which candidates are skilled at obtaining value for money? This damning graph should be front-page news, even though, alas, it was left to the the odious Puffington Host to provide it. It shows how much each Republican candidate spent in New Hampshire, divided by the number of votes received. And guess what? Those candidates who are most "establishment" got overwhelmingly the least return on their investment. Jeb! Bush spent $1,150 per each vote - which is actually an improvement on the $2,800 per vote that his Iowa loss cost him. As we work our way down the chart, we see the candidates listed in pretty much the order you'd expect. New Jersey Gov. 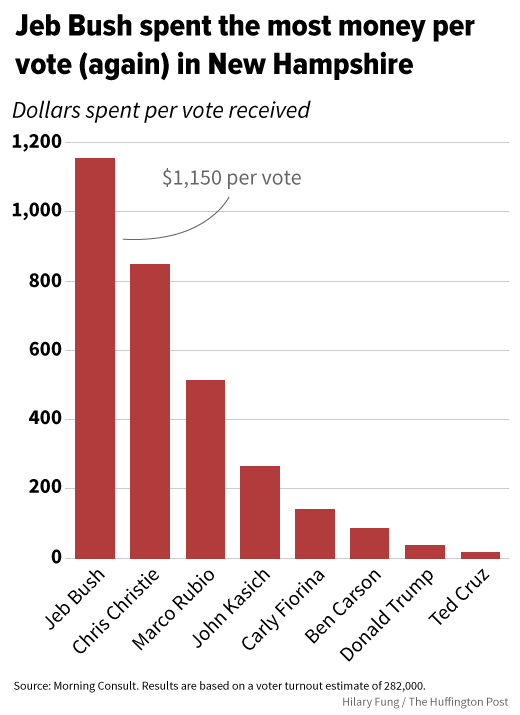 Chris Christie spent a bit over $800 per vote, looking good only in comparison to Gov. Bush. Marco Rubio was just about the median, at $500. Who's the frugality winner? None other than arch-conservative Ted Cruz. For Sen. Cruz, one vote cost a mere $18. Donald Trump, whose anti-spending credentials have been questioned, spent only $40 per. Set side-by-side, the difference is astounding. Gov. Bush spent almost sixty-five times more per vote than Sen. Cruz, and did worse! Does this, perhaps, provide an explanation for $300 toilet seats and $50 hammers? If a Bush isn't disciplined with the money that he had to raise by promising we know not what, the money that is the mother's milk of his campaign, how could we possibly expect him to watch out for spending pennies extracted from your hide by the almighty power of the IRS, which costs him no effort at all? You might assume that being rich makes someone less inclined to count the change. Let's face it: that's often true. Our TV screens are full of rich people who spend money as though it's going out of style. Mostly, though, these are people who have always had money that was earned by their parents, or whose money arrived in a lightning strike like pop-stardom. Even better, they aren't spending our money. In contrast, people who have earned their wealth through years of hard work tend to be a lot less eager to part with it frivolously. For all Rubio's stories of his poor, hardworking father, he doesn't seem to have learned as much frugality from the experience as might be wished. Donald Trump, for whose father a loan of $1,000,000 was "small," nevertheless didn't spend like someone to the manor born. Maybe running a sometimes-successful property business really is good experience for budget-watching? Assuming that The Donald ultimately secures the nomination, as seems increasingly likely, he will need a vice president. It's cheering to see our two favorite potential VPs, Dr. Carson and Sen. Cruz, neatly bracketing Mr. Trump in the spending-wisdom stakes. Let's hope they can paper over their differences when the time comes - oh, wait! There's some more news that's worthy of the front page! ...We have to thank the candidates because they really ran. We have some very talented people. And to be victorious against some of these people, even if it's for one week... but they really are, they're terrific. A number of them called and I just wanted to thank them. But I wanted to congratulate the other candidates. Can it be that the brash, bullying Donald Trump is... making nice to people he'll be needing shortly? Or maybe he's been like that all along and we just haven't noticed - after all, one can't build skyscrapers in the most sclerotically overregulated city in the world without knowing how to win friends and influence people. Not a bad skill for a President to have. We stand by our endorsement of Mr. Trump - while, as he himself does, wishing well to several of his worthy competitors. So in point of fact, he has the **worst** record of any of the GOP candidates on wasting other people's money and by considerable margin. "Can it be that the brash, bullying Donald Trump is... making nice to people he'll be needing shortly?" There is a continual effort made by Trump supporters to minimize his family's existing wealth/status/connection and maximize what he did with the "little amount" he started with. Petrarch says "$1 million loan" which leads us to believe that Trump got nothing more than a small amount of banking capital that he had to pay back. 1) In his 20s, Trump became president of his father organization (which would become The Trump Organization). That gave him immediate control of a firm that was valued at $200 million. 2) Even if you split the value of that firm equally with his siblings, his own stake would be worth $40 million at a minimum. The firm was no split or liquidated - he still controlled the full $200 million firm and its direction and investments. 3) His admittance to Wharton and his ability to secure deals (like the Penn railroad yard) and develop in Manhattan early in his life were all based on his family's existing connections. There are records of Trump calling in favors throughout the 70s and 80s based on Fred Trumps established history. 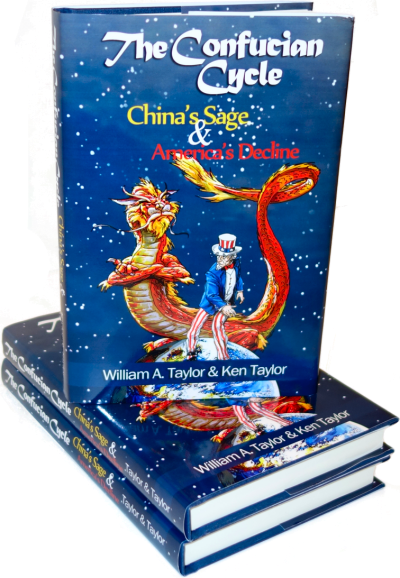 Anyone who has any business experience knows what an enormous difference it makes to start with this type of access to capital and financial inertia. 1. How many separate LLC's does the Donald own? 2. How many went bankrupt? You did that work - 4. 3. Now find out what the average success rate of a new business is. Five years survival is the usual test. Remember Donald started with no businesses so everyone he owns owes their continued existence to him. Then if you really want to get courageous you might place Donald's success/failure rate on the good old bell curve and find out what kind of business manager he really is. Once you have done that, I hope you like the taste of shoe leather - you really blew it. Seriously, Sparky, your reply is almost incomprehensible, but I'll try to respond under the optimistic assumption that you really care about the truth. First, you appear to be conflating the success rate of startups with bankruptcy. They're two entirely different things. Very few small businesses succeed, yes, but they don't go **bankrupt**. They simply run out of money (or time) and stop operating. The owner turns it off, or lets the business go dormant, and moves on to other things. The Donald took large successful billion-dollar businesses - businesses that had **already** succeeded - and drove them into debt and then bankruptcy. In every case, the debt he ran up (and escaped from) was other people's money. One time, in 1990, he escaped over $2 billion from creditors. "Remember Donald started with no businesses so everyone he owns owes their continued existence to him"
That is patently false. At the young age of 27, Donald was literally handed a $200 million business that his father, Fred, built. Now, if you care about the truth, as opposed to being a one-candidate shill, these things matter to you. You might still favor Trump, but you won't continue spouting nonsense about his business acumen. 1. Most of his companies are startups and he is EXTREMELY successful. Shall we say that you are a successful denier? 2. What was the cause of the Casino failures in Atlanta City? Hint: it is abbreviated Gov. 3. Donald got out of those casinos before the rest of the other casinos went belly up due to government so he didn't throw good money after bad. How much did the other casinos lose when they failed? 4. As far as patently false, your statement that Donald was handed 200 million implying that is why he is rich. That was his inheritance on the death of his father and actually he was worth more than that already. A worth he build himself. Business succeeds or fails both on management but also on the business environment that exists. The thing that management cannot control is government stupidity such as happened in Atlantic City. When that happens all you can do is either hunker down or leave. The decision that all the major casinos made was to leave. Donald, being the better businessman got out early. Info, if you cared about the truth as you claim, you would know both sides of the story, not just the Huffington Post side. Donald is an exceptional businessman, and an exceptional politician. As for you, I would never trust you to manage my money, much less run the government. 1) Which of his companies are "startups"? The Trump Organization as a corporation is several decades old and its holdings are hotels and casinos (mostly). In many cases, the hotels and casinos were successful standing businesses long before Trump came along and bought them. In what sense, then, are these "startups"? 2) Ha! This one is precious. The Trump apologists now blame his business failures in Atlantic City on the politics of Christie. Wow, points for creativity! 3) This is the other creative, albeit overplayed, excuse you hear on Trump's debt dereliction. Instead of using ROI or EPS or other normal objective measurements to gauge business success, they say Trump was smart because "he got out faster" then the other morons who copied his business model. That's what "business success" and "acumen" are reduced to in Trump Derangement Land: bailing fast on those sucker creditors. 4) For goodness sake, what are you even debating here? I never said "he was rich because he got 200 million from his dad". - Whether he is the "great great businessman" he claims to be. Go back up and read what I actually wrote, man. Good lord, you're inventing entirely new strawmen at every turn. I don't know why I keep tring to fix stupid, but maybe some other readers will benefit. Your assumption is that he is not a good businessman and he only succeeded because he got an inheritance from his father. That is what you said. That inheritance represents 2% of his current wealth. Rich kids don't succeed because they are handed money. They generally fail. You simply do not know business. No the bankruptcies did not happen during Christi so why bring that up? Do you really think we would fall for that? Governors do not pass laws. Oh I guess that is news to you, but really why are you not writing for the liberal press. You have their tactics down pat. You twist and bend everything to fit your agenda. Our current government is almost totally made up of lawyers. And yet they are running the largest corporation in the world. What major corporation allows lawyers to run the enterprise? Isn't time we hired a professional businessman to run the United States of America? "The business of America is Business". Nope, even that's false. In fact, it's the exact opposite. The Government didn't hurt Trump, it helped him on the back of the American taxpayer. 1) He is not good with other people's money. He's quite irresponsible with it. Getting rich doesn't equate to being good with other people's money necessarily, and when you're an elected official, that matters. 2) He did, quite obviously, get rich (and land many impossible deals) early in life by standing on the sizeable shoulders of his family. Those are my only two points. This is supposed to be a thinker's website, not the Huffington Post sewage hole. So I read your two very biased posts. One from the LA Times, and one from CNN. Their slant is "destroy Trump" and they do tear into him and Info loves it. But still Info doesn't consider all sides of the story and clings to the worst possible interpretation. I guess if Fox News needs a flaming liberal to liven things up a bit, we have our Info blogger. I will give the last word to our SoS guy - Info.